The St. Louis Cardinals do an enviable job of maintaining continuity with their roster while mixing in young talent. The 2019 squad shouldn’t be any different. Under first-year manager Mike Shildt, the team again projects to contend for an NL Central title. 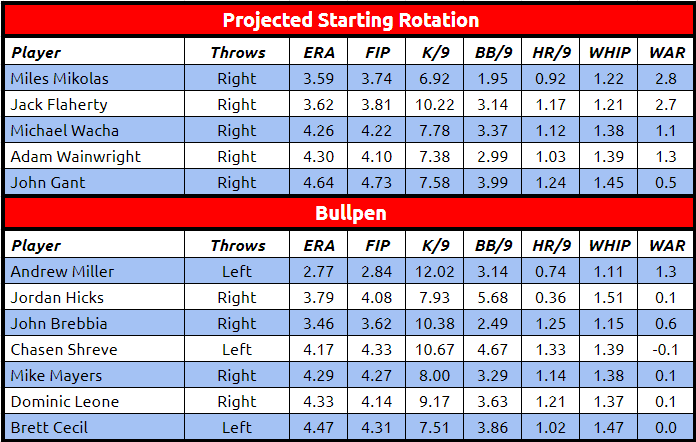 However, St. Louis does have its fair share of uncertainty, particularly with the pitching staff. The majority of the Cardinals core returns in 2019. The notable exception, of course, is the enormous addition they made at first base. 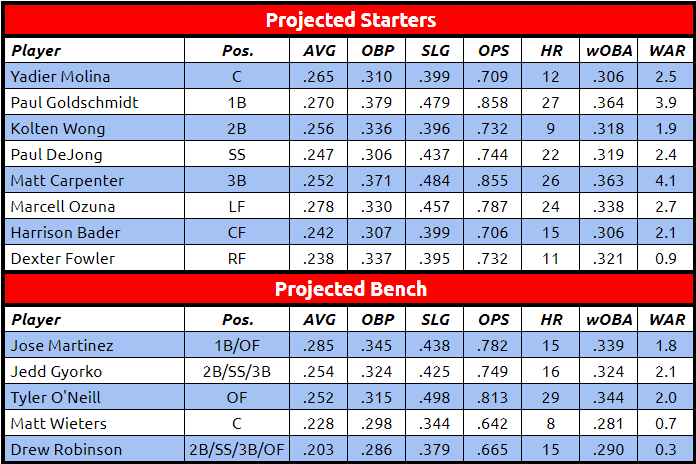 Paul Goldschmidt turns a solid lineup into a potentially scary one. Since 2013, only Mike Trout and Josh Donaldson have a higher fWAR than the 31-year-old, who’s coming off another monster year (145 wRC+) despite a slow April and May. He’ll anchor a lineup that also features sluggers in Matt Carpenter and Marcell Ozuna. 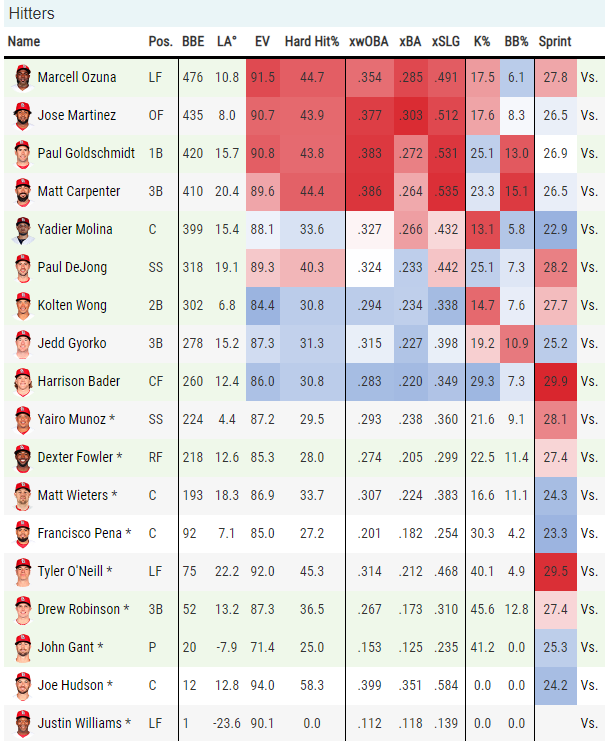 Carpenter is coming off a 36-homer season, while Ozuna — despite relatively disappointing numbers overall — had a monster second half and was among the league leaders in average exit velocity. St. Louis has strong pieces to supplement their three core bats, as well. Paul DeJong has quietly proven to be an above-average hitter in his first two big-league seasons (111 wRC+), giving the team a long-term solution at shortstop. Goldschmidt’s arrival likely pushes Jose Martinez to the bench, where the Cardinals can hide his defensive shortcomings a bit more. Martinez should split some time with Dexter Fowler in right field to keep his powerful bat in the lineup. As Yadier Molina enters his 16th season as the Cardinals’ catcher, Harrison Bader is set for his first as the full-time center fielder. Neither is a huge threat at the plate, although they have some pop; they bring the most value on the defensive side of the ball. Fowler rounds out the projected starters. He’s coming off his worst season as a major-leaguer (-1.2 fWAR) in his second year as a Cardinal. He signed a five-year, $82 million deal in the 2017 offseason that already looks like a bust. Led by Martinez, who had a 125 wRC+ last season, the Cardinals should have a solid bench. Jedd Gyorko can play all four infield spots and provides some pop, swatting 61 home runs in three seasons in St. Louis. One player to watch is Tyler O’Neill, a consensus top-100 prospect. He got his first cup of coffee last year and posted a 114 wRC+ in 142 plate appearances. While he doesn’t have a clear path to regular playing time, he provides tremendous power. Between Triple-A and MLB, he mashed 35 homers in 2018. The team could send him back to Triple-A to get regular playing time, but he has little left to prove in the minors. He figures to take over as the everyday left fielder if the Cardinals let Ozuna walk after the season. The pitching staff brings a lot more question marks than the position players. Miles Mikolas (2.83 ERA, 3.67 xFIP, 3.93 SIERA) had a breakout season after returning from Japan in 2018, earning a four-year, $68 million extension this offseason. He’s the team’s Opening Day starter. Behind him, former top prospect Jack Flaherty (3.34 ERA, 3.58 xFIP, 3.57 SIERA) will look to build on a strong rookie campaign. Beyond that, the group looks shaky. 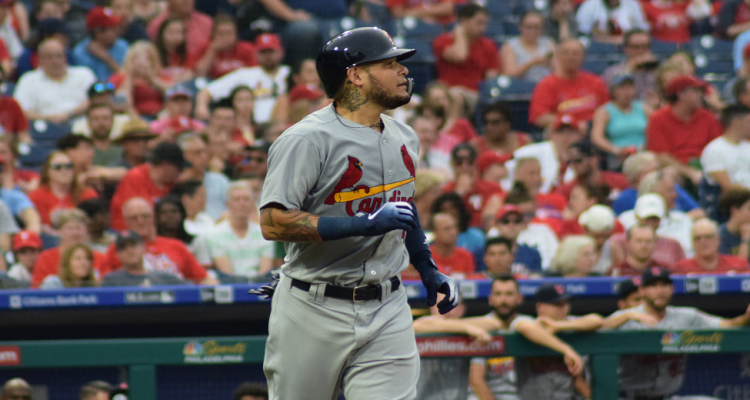 Carlos Martinez (shoulder) will not be ready to start the season. His role is also uncertain; he could return to the bullpen, where he started his MLB career. Adam Wainwright is 37 and on the downswing of his career. Entering a contract year, Michael Wacha is coming off an injury-plagued season in which his walk rate skyrocketed to a career-worst 10.1% and his strikeout rate fell. Right now, John Gant looks to be the favorite to replace Martinez in the rotation, in large part because he’s out of options. Dakota Hudson, Daniel Poncedeleon, and Adam Gomber are in the mix as well. The bullpen, while improved, looks a bit top-heavy on paper. Andrew Miller will give the Cardinals a stopper to pitch in big situations late in games. 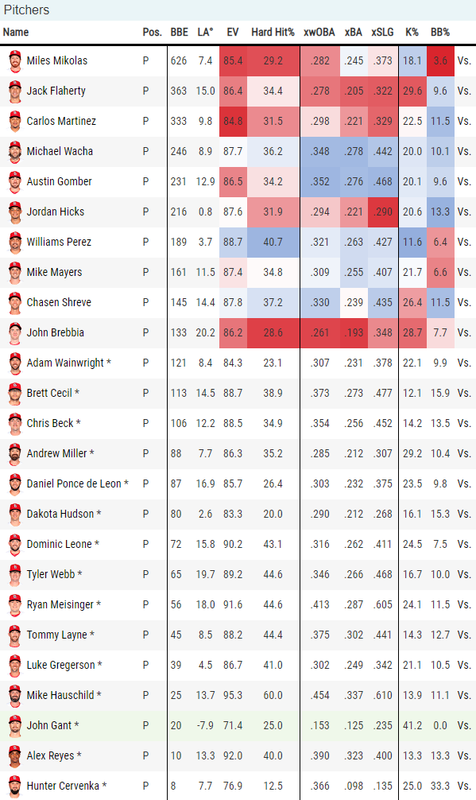 John Brebbia (3.20 ERA) quietly had solid numbers backed by strong peripherals (3.79 xFIP, 3.17 SIERA) in 2018. There’s no doubt Jordan Hicks has the most potential of the group, however. Hicks hit 105 mph on the radar gun last year, and it’s miraculous that anyone can hit his sinker. He’s expected to get most of the save opportunities. He doesn’t strike out many hitters despite his velocity and gets in trouble with his control. That said, Hicks only figures to get better after jumping straight from High-A to the majors last season. The rest of the relief corps leaves something to be desired. Brett Cecil has been a disastrous signing and only has a chance to make the roster because he’s still owed $15 million over the next two years. Chasen Streve, who was acquired from the Yankees for first baseman Luke Voit last July, has strikeout stuff but struggles with control and the home run ball. Mike Mayers has some intrigue after raising his average fastball velocity from 93.8 mph in 2017 to 96.1 mph last season, but his secondary offerings aren’t flashy. Also in the mix for a bullpen spot is top prospect Alex Reyes. After two seasons largely derailed by injuries, the Cardinals want to ease him back into action as a reliever in 2019. They could use the same blueprint they did with Carlos Martinez and convert Reyes back to a starter in 2020. His stuff is on par with Hicks’ and would prove electric in one-inning stints. The biggest story out of Cardinals camp this spring is the health of Carlos Martinez. For a second straight season, the team’s No. 1 arm is already dealing with right shoulder issues, this time described as “weakness.” He has just recently resumed throwing and will not be ready for Opening Day. Martinez recently had a platelet injection in the shoulder and may not return until June. Utilityman Jedd Gyorko is dealing with a calf strain but is expected to be ready for the start of the regular season. 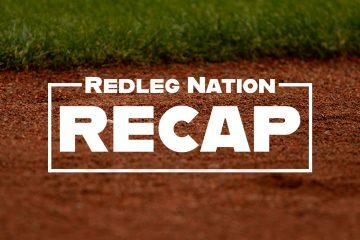 Reliever Luke Gregerson, who the Cardinals signed to a two-year, $11 million contract last offseason, also looks headed for the injured list to start the season as he recovers from a shoulder injury suffered last season. The projection systems don’t expect the Cardinals to improve on last season’s 88-74 record despite adding Goldschmidt and Miller in the offseason. That said, they’re still expected to contend for the NL Central crown and a playoff spot. Despite having a slightly worse record in the FanGraphs system, St. Louis projects to sneak into the postseason as the second NL wild card. PECOTA has the Mets besting the Cardinals by one game for the final wild card spot. Regardless of what actually happens, you can expect the Cardinals to contend again — just like they have every year since the turn of the century. The Cardinals are who they usually are…. a well-run franchise that rarely allows itself to be overcommitted regarding player contracts and has a consistent pipeline of MLB-caliber talent from its farm system. Those 2 factors allow them to bring on a Harrison Bader and not worry about trading a Tommy Pham as he approaches age 30, for example. Or having Jose Martinez as cost-controlled cover if Goldschimdt isn’t back in 2020. All that said, Matt referenced Brett Cecil….St. Louis also missed on Dexter Fowler as a free agent signing, and are now likely stuck with him through the 2021 season (he has a full no-trade clause). Even well-run teams can get gummed up to some degree by free agency, which speaks to the importance of not gutting the farm system, which the Reds did not do this off-season (thankfully, IMO). Not in Brewers or 2015 Royals “Flag or Bust” mode yet. Not trying to make a prediction, but really, depending on Paul Goldschmidt and Matt Carpenter (and their production), the Cardinals could really fall off the table this year. I look at the talent, and they really don’t look all that hot. Adam Wainright, might just be too old to be that effective. I go back to the days of Stan Musial and have attended a lot of Reds/Cards games and have never felt their fans were obnoxious. A number of Cardinal fans usually come over to Cincinnati and their fans come across as knowledgeable like Reds fans. There’s nothing about this Cardinals team that looks intimidating and I’ll be surprised if they contend for the division title. Yes, Goldschmidt is a beast. And yes, Ozuna and Carpenter could be quite good. But there’s no one else in their lineup that looks to be, at best, a bit better than an average major league hitter. And offense (and perhaps the bullpen) is likely to be the strength of this team. The starting rotation looks questionable. Scouting reports may well catch up to Mikolas. Wacha and especially Wainwright appear to be on the decline slope of their careers, and Martinez is battling lingering injury. Again, not intimidating. In the NL Central I’ll be very surprised if they win 85 games, and it won’t shock me if they end 2019 with a losing record. They’ve been an amazing franchise so it would be foolish to just dismiss them this year. But I think Cardinal fans should brace for another season without a playoff slot in October. That would be really bad news for the Birds. Next season could represent a serious organizational downturn with the FA loses they have pending. Agree Cossack. The Matheny firing was almost unprecedented for the Cardinals. With the free agents they lose for 2020 this is a key year. I don’t see it going really well, although if they’re starting pitching holds they could at least have a winning season. Hard to picture them in the playoffs though. The NL Central will be tough.